Cigar-box guitar fun with gritty blues, almost-Appalachian folk, cabaret, comedy, choked voices and rum hangovers in this largely live and wholly raw lo-fi mixture! 18. Why Stop at Two? Gritty and raw blues, almost Appalachian folk, ungenre-able messes, distortion, lo-fi, jammed fingers, choked voices and rum hangovers. A home-made cigarbox, minimal production and a group of online- and gig-tested songs, some serious, others cruel, some just for fun. The cigarbox guitar is fretted, and usually played finger-picked/strummed. There's no Delta-style slide work. 2. 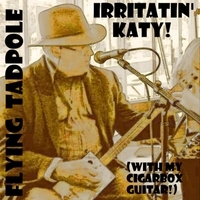 IRRITATING KATY: I'm always in trouble with her when I pick up a cigarbox...especially when it's jog-a-long 12-bar blues. 3. KILLERS OF EDEN: a straight folk song. The shore-based whale fishery in Eden (Twofold Bay) New South Wales, ran for about 150 years in partnership between humans and Killer Whales ("orcas" for the soft-n-fluffies). The Killers' payment was to have the carcass until ferment gases brought it to the surface again. Part of the boat crews were Aboriginal, and the Killers were considered to be deceased tribal members returned. The "tower" is Ben Boyd's lookout tower. 4. CLICHE BLUES: Flying Tadpole and his multitracked Death Machine present...Three cigarbox guitars running, fingered (no slide or plectrum). 12-bar blues is the ultimate cliche when you think about it. 5. THE "HOW DO I PLAY THIS THING" SHUFFLE: Instrumental. Flying Tadpole's first CBG public offering, still in use at gigs! 6. CAN'T SEEM TO REMEMBER OLD SONGS: Slow melancholy CBG waltz with the old man's memory failing. 8. BLACK CAT RUM: Drunken slow blues. Do you think Black Cat Rum would pay for this advertorial? One-take record, hum buzz click... Tuned GDg. Fingers, no slide, no pick. 9. THE "A" SHUFFLE: Instrumental. To prove that I can play my cigarbox guitar in something other than G, I put a capo on so it'd play in A. And also in A. And in A as well, what's more. 10. HELL'S FOR SALE: Faux-Gospel warning. Two cigar box guitars: actually the same one, different knob settings. Not bad for a folk instrument, hey? Not that I can play it properly which is why this is in G. And G. And G also. With a brief shift to C! Wow! Even D somewhere! D-Double wow! That rise and fall phrase is similar to many others, notably Midnight Oil (Dead Heart). I guess they could launch a demand to share the profits, based on five notes. And not one is this bad." 13. JAMMED FINGERS: Instrumental jam. Self-indulgence by Flying Tadpole. You were warned. The cigarbox guitar in all its complexity playing in G. And also in G. In G as well. And it can play in G too. So we called in some assistance. One-shot recording, although the individual tracks were sequential. From L to R, instruments are CBG, drawbar organ, high hat + bass drum, piano. Very garage. 14. I'M GONNA SPLIT THIS SCENE: A song that arose from an argument on February Album Writing Month whether it should be split into Lyrics and Instrumentals. As a right-wing reactionary, I should be ashamed of doing this with political slogans. But like Knob Creek Bourbon (overproof), it's irresistible, and with much the same effect a couple of glasses has (ie I fall off my skis). Cigarbox by Flying Tadpole. Piano by Casio Privia PX350. Tambourine by the local pawnshop. 17. ABSOLUT RUBBISH: A moral - don't drink like a fish. 19. LONG HOT NIGHTS #2. Fire and fear. Two cigarboxes running. 21. SITTING HERE, JUST... Folk. Another almost-Appalachian sound out of a cigarbox guitar. Two cigarboxes, the bass guitar is needed to tie them together.